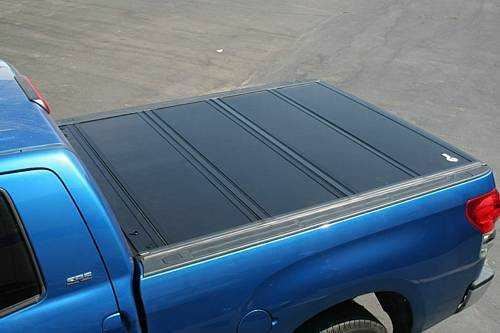 If you're looking for a hard tonneau cover that literally does it all, the BakFlip G2 is it. From sleek contemporary styling to state of the art function, BakFlip G2 hard tonneau covers are sure to impress the most ardent critics. Made from tough aluminum panels, BakFlip G2 hard tonneau covers offer fantastic security, operate easily from either side of the truck, handle any kind of climate, provide full access to stake pockets, and most importantly, offer 100% unobstructed access to your entire truck bed. Hauling large items in your truck is never a problem. The ability to lock and load is finally an option with the patented features that ONLY BakFlip hard tonneau covers can offer. No other hard tonneau covers in the world can do what a BakFlip tonneau cover can do, and for the modest price of these phenomenal hard tonneau covers, there's really little that anyone can think of that the BakFlip G2 doesn't offer. Put a BakFlip G2 hard folding tonneau cover on your truck and join the thousands of folks that have made this incredible product the number 1 selling folding truck bed cover in the world! Copyright © 2014-2019, LINE-X of Madison - All rights reserved.